One day, Mona Neville may be riding in an airplane over Pasco County searching for signs of Southern Pine Beetle infestations. Another day, she may be talking to a homeowner who wants to create a stewardship plan for his property, or explaining a cost-share program aimed at encouraging healthier forests. Jake English and Mona Neville discuss plans for managing English’s pine forest, and also talk over some cost-sharing programs available through Florida Forest Service. Or, perhaps she’ll be providing technical advice on tree ordinances to local governments or guiding some scouts through some forested land — in their quest to earn a badge. Neville’s job — as the forester for Pasco County — is anything but a 9-to-5 behind the desk routine. In fact, if you call her, chances are she’ll be out in the field. 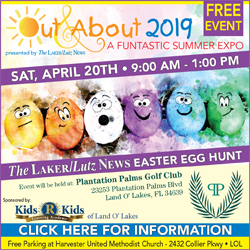 And that’s exactly how it should be, said Neville, who grew up in Wesley Chapel, graduated from Land O’ Lakes High School, and received her bachelor’s degree in forestry management from the University of Florida. 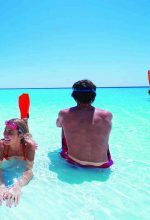 “We’re out of the office more than we’re in the office, or we try to be. That’s the whole goal, working with the landowners,” Neville said. She began her career with the Florida Forest Service Withlacoochee Forestry Center, as a state lands forester. She was delighted when she had the chance to return to her roots. She became the forester for Pasco County in January and is stationed in the forest service’s Dade City office. “As the county forester, we help any private landowner with any of their forest management needs,” Neville said. She also can help local governments with urban forestry or parks forestry issues, she said, And, she can advise private landowners on urban landscape issues, she said. “It may be somebody in a development that calls me and it looks like their tree is dying or declining, or they don’t know what type of tree it is, and they want to know more about it. I’ll go out and see them,” she said. “It could be shade tree calls, or forest health calls,” Neville said. 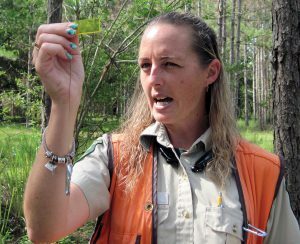 Pasco County Forester Mona Neville uses a prism to help gauge the number of trees in an acre of pine forest. “Some of the bigger developments, that do their own maintenance, will call when they have sick trees,” she said. If a homeowner’s association needs technical advice, she’s happy to provide it. The Withlacoochee District includes Pasco, Hernando, Citrus, Sumter and Lake counties, and each county has its own forester. Neville said she’s noticed a growing interest in the preservation of forested lands. “That whole sustainability concept is really starting to come back,” she said. Recently, she made a visit to Jake English’s wooded property in Land O’ Lakes. 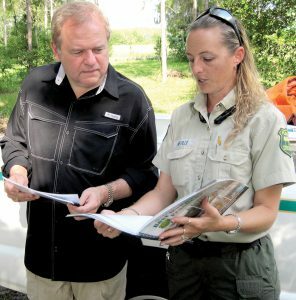 She was there to help English work on his stewardship plan and to explain some cost-share programs available through the Florida Forest Service. There were cows grazing on the property. “They go through the pine stand and chew up all of the grass, and mow it for him,” she said. “Florida Forest Service offers several cost-shares, different times a year,” Neville said. Those include programs to prevent the spread of Southern Pine Beetles, to eradicate cogongrass, to thin out pine stands and to replant trees. “This property is due for a thinning, because trees can only grow so much before they’re competing too much for nutrients,” Neville said. “A healthy stand needs to be thinned, usually 15 (years) to 20 years after planting. And, then you go out another 15 (years) to 20 years and you start getting the bigger, more quality, better trees,” she said. “The prescribed burning, a lot of people don’t realize, puts a bunch of the nutrients back into the ground. “We will assist, when we can, to help landowners do a prescribed burn,” Neville said. In addition to returning nutrients to the ground, a prescribed burn reduces fuel that can spread fires quickly when lightning sparks a blaze. “Most of our wildfires are lightning strike-induced,” Neville said. When a stand is thinned out, the remaining trees have a better chance to thrive. “Cogongrass is an exotic, invasive, that was brought in originally to feed cattle, except they found that cows don’t like it,” she said. “It usually takes two years, if not more, to kill a patch of cogongrass,” she said. English grew up on his property, but his family later sold it for a planned subdivision. When the economy crashed, plans for the subdivision were dropped, and English was able to buy the property back four years ago. “He has a stewardship plan written up, which is a 10-year plan that goes through and pretty much maps out what his goals are for his property,” Neville said. “Normally, when we do the stewardship plan, they do the best management practices,” she added. “This is a huge help for me. Otherwise, I would be clueless as far as how to control invasive weeds and other issues,” English said. After consulting with English, Neville will hop in her white truck and head off to her next assignment. Her knowledge, coupled with her enthusiasm, conveys her passion for her work. “I love the fact that it’s never the same,” Neville said. If you’d like to know more about cost-share programs through the Florida Forest Service or about services offered by the Pasco County Forester, contact Mona Neville at (352) 523-5101 or moc.a1555629598dirol1555629598FmorF1555629598hserF1555629598@elli1555629598veN.a1555629598noM1555629598.